Ray Mears Fruit Training announced. At a recent event to publicise the continuing line of Touch Generations software, Satoru Iwata revealed a new title in development for Nintendo DS which has already got chins wagging: Ray Mears Fruit Training. 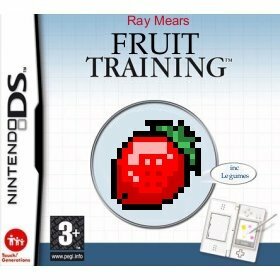 2008 will be the year that Nintendo, along with Ray Mears, teach everyone all about fruits and that. 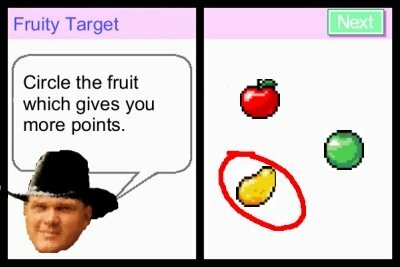 My fruit training game could save lives. Last week, I hadn’t had anything to eat for literally 20 minutes. Luckily through training my brain to be good at seeing fruit, I was able to not only identify, but eat a mango that was underneath a chair; and a crisis was averted. Ray Mears Fruit Training should be in the shops for harvest festival. ← GTA IV – Does not contain any fruit.